Judging by the lack of votes, it seems like more people need to experience the films of Studio Ghibli! If that’s the case for you, you can’t go wrong with any of the films listed above. I’m not a huge fan of animated features, but there’s nary a Studio Ghibli film that I didn’t enjoy. In fact, Grave of the Fireflies may be the best *war* movie I have ever seen, animated or not. I cannot recommend it enough. This Week’s Poll: We are in the home stretch of 2012, and there are still plenty of upcoming films to get excited about. My question for you this week is: what TWO upcoming films are you most excited to see? Shame about the lack of votes. My personal favorite is ‘Laputa: Castle in the Sky,’ but I love them all! I actually did a review of ‘Whisper of the Heart’ recently. I actually haven’t seen either of those, but I’m going to try to soon. I also want to finally watch My Neighbor Totoro, which I have heard nothing but great things about. DO IT!!! Every single Studio Ghibli movie is special in its own way. Hobbit and Django for me. Good choices! Though I have to admit I am a little worried about The Hobbit. There was no reason to stretch that out into three films, but perhaps Peter Jackson can strike gold again. Yeah, I agree with you about stretching it. I was honestly just a little skeptical about making two movies out of it instead of just one… but we’ll see. If i had voted, i would’ve voted for Howl’s Moving Castle. Amazing Movie!! It sounds like I need to do a better job promoting these polls. 😉 That’s a great movie indeed. Thanks for stopping by! Ok for this week I voted for Pi and Django!! 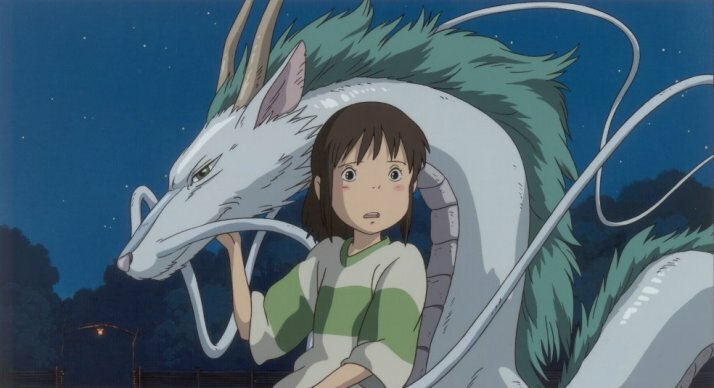 I voted for Princess Mononoke, but Spirited Away is also a superb movie! I know there are many people who are “afraid” of watching japanese animated movies, because they think they all be children’s movies, but that is not the case. A lot of these anime movies are wonderfully scripted, directed and drawn [!! ], and many of them have deeper and better stories and characters than many regular movies! My favorite of this type of Anime movies is actually Nausicaä of the Valley of the Wind, which was made by the predecessor to Studio Ghibli. Other great ones are Akira, Ninja Scroll and Ghost in the Shell. Seen any of those? Princes Mononoke was kinda boring…, The best three studio Ghibli films (In my opinion) are 1. How’s Moving Castle, 2. Castle In The Sky. and then My Neighbor Totoro, and Spirited Away are tied for 3rd. Princess Mononoke was the first Ghibli film I saw, and I liked it quite a bit. My personal favorite is Grave of the Fireflies, though. That was one devastating but incredible film. Will try to catch Castle in the Sky and My Neighbor Totoro soon! Well said, man. I am usually apprehensive about animated films, but I am rarely disappointed by Studio Ghibli. Their films have a power to evoke emotions unheard of in most American animated features. I would definitely like to branch out into other anime films. Out of those you mentioned, I have only seen Akira, which I struggled with. I had a hard time keeping up with what was happening, and didn’t like the main character at all. I’ll have to check out the others, though, starting with Nausicaä of the Valley of the Wind. Thanks for the recs! Nice to see Spirited Away won, but then again I’ve only seen just the one 😀 For the current poll I voted for The Hobbit and Les Miz. I wasn’t too enthused on the latter initially but the trailers sold me! I couldn’t bring myself to vote on the Ghibli films, I love them all, even the music video they produced for Chage and Aska is awesome (If you ever get a chance to see it). They are the one company who has not disappointed me, even when I used to watch Nausicaa as Warriors of the Wind. For a spliced up mess that it was in the eighties it was a better animated film than most that was thrown at me. The two I cannot wait to see out of this poll and voted for is Anna Karenina and The Hobbit. Are you going to be picking up Ni no Kuni next year? Studio Ghibli + video games seems like a match made in heaven, and that RPG is looking awfully good. If I buy a PS3 it will be my first purchase. I’m not really into namination so I didn’t vote last time 🙂 This time I’m voting for Killing Them Softly and Hitchock, though I can’t say I’m extremely excited about any of upcoming movies. I think Hitchcock is one of my most anticipated, too. The more I hear about that one, the more intrigued I am. Upcoming movies I’m most excited about? There are so many. Maybe the indie Frances Ha, which got great reviews at Toronto. The Imposter also. I still haven’t seen Skyfall, The Master, or Holy Motors. I voted for Silver Linings Playbook and Amour based on the awards won. I’m looking forward to Frances Ha, too, but it looks like that’s set for a May 2013 release here. The Imposter is a must see! I have to imagine that will hit DVD sometime soon. Also interested in Silver Linings Playbook and Amour due to the great buzz they have been getting. Plenty of great options coming up! I really need to catch up on all of my Studio Ghibli films. Me too, man. I think I have seen seven in total, but there are still so many I really want to watch. Reblogged this on URdanielle's escape to the city.